How do you quantify frustration, in a sports context? How much pain and ache can a heart take over a team’s repeated failures? And how long do you wait for success before you give up hope? For hockey fans in this region, those questions have seemed to have no answers since the day in 1974 when the Washington Capitals began play in the NHL. The early years brought on so much misery. The 8-67-5 record in the inaugural campaign remains the worst single season in NHL history, which dates back to 1917. The Caps eventually came to resemble a functioning franchise, but they also became snake-bitten. To wit, since 1942, 28 NHL teams have lost a best-of-seven playoff series after leading 3 games to 1. The Capitals have five of those epic fails, more than any other team. I witnessed one of those personally, the first in 1987. The New York Islanders forced a seventh game in the division semifinals at the old, now dearly demolished Capital Centre in Landover. The game took place on the night before Easter and I was there, supposedly helping a friend who worked for the Caps. I found out just before the 7:30 p.m. opening faceoff that my assistance was no longer needed. With nothing else to do on a Saturday night, I decided to stay and watch the game. Little did I or any of the more than 17,000 in attendance know that we were about to watch history. The Caps led 2-1 through most of the third period until New York tied the score with five minutes to go, which is how regulation ended. The game continued through three overtimes, the longest NHL game in history to that point, ending eight minutes into the fourth overtime, when the Islanders mercifully scored. The contest ended well past 1 a.m. and ran so long that Capital Centre officials re-opened at midnight the concession stands that had been closed in the third period two hours earlier. The cloud of frustration that has hovered over the franchise continued as the Caps got to the Stanley Cup Final in 1998, only to be swept out by the Detroit Red Wings. 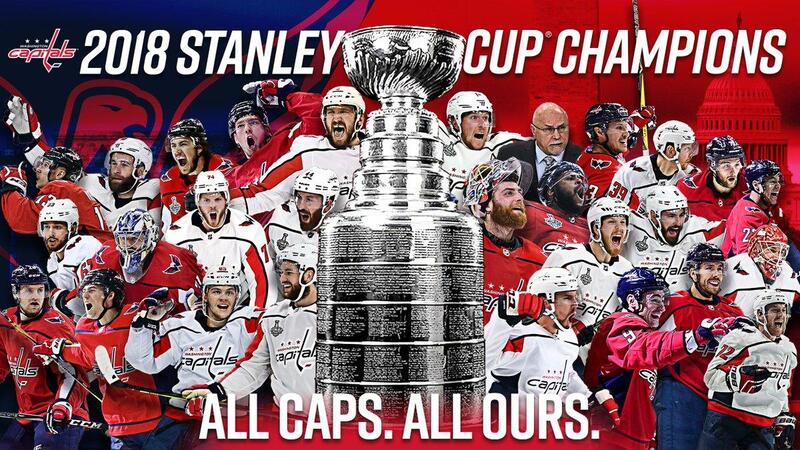 The ineffectualness extended into the 21st century as the Caps finished with the most points in the league three times in the last nine years, including the two previous seasons before this one, only to see their seasons end without a championship. All that futility makes what happened last Thursday so remarkable. The Caps began these playoffs losing their first two games at home to Columbus, only to win four straight and advance to the next round. There, they faced their longtime nemesis, the Pittsburgh Penguins, dispatching them in six games. The Caps then beat the Tampa Bay Lightning in seven games to advance to the Cup Final. In the final, Washington met the Vegas Golden Knights, a team that didn’t exist the previous year, but had won over casual fans with their success. The Caps dropped the opener, then won four straight to capture the most celebrated trophy in North American professional sports. You can build a pretty sizable wall of anguish and frustration over 44 years. Thankfully, you can tear it down in one magical week. And that’s how I see it for this week.